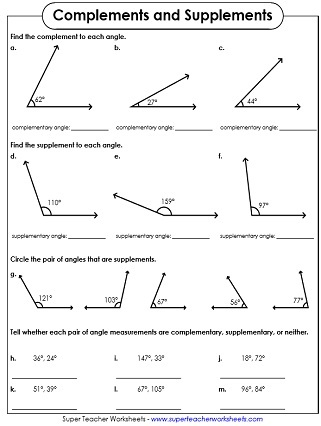 The geometry worksheets on this page can be used to introduce and review the concepts of complementary and supplementary angles. Most worksheets on this page align with Common Core Standard 7.G.B.5. Pairs of complimentary angles are shown. The measurement of one is given. Students must calculate the measurement of the other. This worksheet serves as a basic introduction to complementary angles. At the top, the concept is described. At the bottom, students are instructed to find the complement to each angle shown. On each problem, students are shown two angles. The measurement of one angle is known. The other is the supplement, which must be calculated. This is a very basic introduction to supplementary angles. At the top of the page is an explanation box. Then students are shown nine angles. They need to find the supplement for each. This page has illustrations of 2 adjacent angles. Students must recognize the combined angle as additive. There's also an angle word problem that requires students to divide. Students find complements and supplements. Then they circle a pair of angles that are supplements. Then they determine whether each pair of angles is complementary, supplementary, or neither. 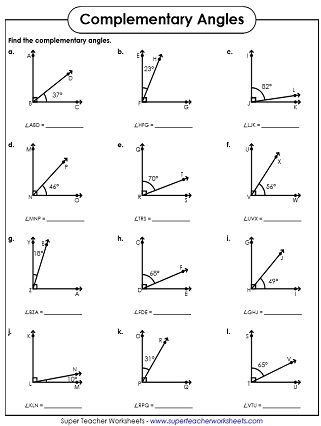 Find the complements and supplements of the angles shown on the cards. This file includes 30 cards that can be used for learning centers, peer help sessions, or on your document camera. Here you'll find a collection of printables for teaching students how to measure angles with a protractor. There are also worksheets on types of angles (obtuse, acute, right). This page has many worksheets on calculating the areas of triangles. Here you'll find a selection of worksheets for teaching surface area. Here's our geometry index page that will link you to all geometry topics on our site.